This is a book about yoga. It’s not about what most people think yoga is. 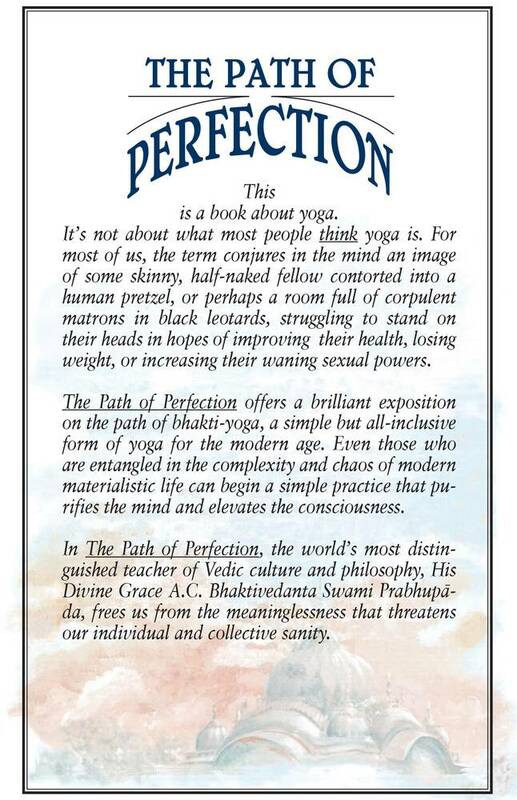 The Path of Perfection offers a brilliant exposition on the path of bhakti-yoga, a simple but all-inclusive form of yoga for the modern age. Even those who are entangled in the complexity and chaos of modern materialistic life can begin a simple practice that purifies the mind and elevates the consciousness. In The Path of Perfection, the world’s most distinguished teacher of Vedic culture and philosophy, His Divine Grace A.C. Bhaktivedanta Swami Prabhupada, frees us from the meaninglessness that threatens our individual and collective sanity. When we see a book with a title like The Path of Perfection, we may react with a bit of common skepticism: “Oh, another book claiming to give all the answers. One more do-it-yourself enlightenment scheme.” And certainly it seems that such skepticism is justified nowadays. Our natural desire for ultimate meaning, happiness, enlightenment, liberation, and salvation has become the most exploited commodity of the twentieth century, creating what one contemporary theologian termed a disastrous “seduction of the spirit.” This seduction is, indeed, the most tragic kind of exploitation. And the unfortunate consequence of this exploitation is a kind of deadening cynicism that discourages our search for self-fulfillment and a means to attain it. The contemporary, thoughtful reader, weary of the many speculative, simplistic books cluttering the bookstore shelves, offering instant formulas for psychological or spiritual salvation, will find The Path of Perfection a welcome relief. Herein one will find a clear, intriguing explanation of the philosophy and practice of mankind’s oldest system of spiritual development—yoga. Now, the word yoga may conjure up an image of some skinny fakir contorted like a human pretzel, or perhaps a room full of corpulent matrons in black leotards struggling to stand on their heads in hope of improving their health, losing weight, or increasing their sexual powers. This is not what we mean by yoga. Here we are referring to an ancient philosophy and meditational system that has been practiced by millions throughout the ages. What has, in modern times, been reduced to a commercially exploited technique of bodily agility and pseudomeditation was once a comprehensive and easily applied form of self-realization. 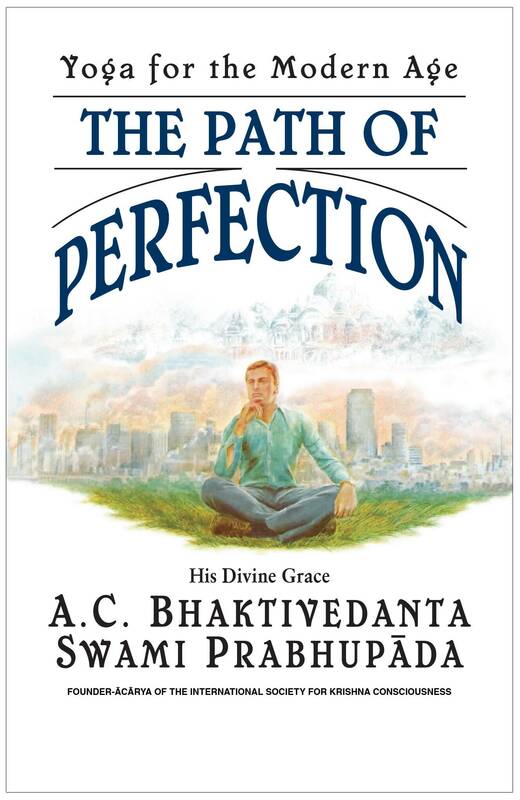 The Path of Perfection consists of a historic series of talks—elaborations on a previously published commentary—by His Divine Grace A.C. Bhaktivedanta Swami Prabhupada (1896-1977) on India’s greatest spiritual classic, the Bhagavad-gita. In these absorbing talks, Srila Prabhupada explores deeply the philosophy of yoga as explained in the Sixth and Eighth Chapters of the Gita, showing clearly how these timeless teachings apply to twentieth century mankind. Srila Prabhupada’s talks probe questions concerning the nature of consciousness, techniques of meditation, karma, death, reincarnation, and even spiritual ecstasy. The Bhagavad-gita, described by one contemporary psychologist as “a remarkable psychotherapeutic session,” appears to us in the form of an extraordinary dialogue between Lord Krishna, the Supreme Personality of Godhead, and His warrior disciple Arjuna. Perplexed and confused about his identity and purpose, Arjuna turns to Krishna, who reveals “the path of perfection” to His able student. The essence of Lord Krsna’s teachings is that one must become a yogi, that is, one whose life is centered on the practice of yoga. And what is yoga? The Sanskrit word yoga literally means “union,” and refers to the union, in love, between the individual consciousness and the Supreme Consciousness, the self and the Superself, the soul and God. Yoga is, indeed, “the path of perfection,” because it aims toward this most exalted human attainment. In The Path of Perfection, Srila Prabhupada offers a brilliant summary of the methods of bhakti-yoga, revealing the universal applicability of this simple but all-inclusive form of yoga. He shows how even those who are entangled in the complexity and chaos of modern materialistic life can begin an uncomplicated practice which purifies the mind and puts one in touch with the Supreme Consciousness.